The winner is ... Walter Coughlan, the founder and director of the Fair Food Company (Pty) Ltd.
"On behalf of all the farmers, and staff and groups that we work with, I am very proud to be honoured," he commented after receiving the award. to supporting the development and growth of emerging farmers in South Africa. Coughlan has established numerous partnerships and designed, facilitated and managed local and international funded programmes. As director of The Fair Food Foundation, he currently engages with public, national government and private sector partners to benefit the emerging farmer sector and manages a dynamic staff of farmer support technicians and agri-processing team members. The Fair Food Company (Pty) Ltd is a level 2 B-BBEE majority black farmer owned social enterprise food business. Emerging shareholder farmers are supported through reverse integrated off-takes and agroprocessing opportunities. Based in KwaZulu-Natal, The Fair Food Company grows, processes and supplies quality vegetables from its groups GlobalGAP anchor farms and HACCP facilities to varied markets. In 2014, the Edamame Development Programme was established. Currently a number of national retail chains are supplied with South African grown and processed edamame. "We are committed to supplying good healthy foods directly to South Africa and the world, in the fairest way possible - growing for good!" Coughlan concluded. Sakhumzi Diko is a seasoned leader, mentor, a professional quantity surveyor, and entrepreneur. In 1999, at the age of 23, Diko, together with his partner, started their own quantity surveying practice, DPV Quantity Surveyors & Project Managers. DPV now has a footprint nationally and is growing from strength to strength. He has been based in Durban, KwaZulu-Natal for over 15 years now. Diko is an accredited mentor by the University of the Free State for coaching and mentoring emerging developing contractors, a role he has been playing since 2005. He has other business interests in property development. Mlungisi Zwane is the director of Siyazenzela Trailers, which was established in April 2010. The company's core business is the manufacturing of custom built trailers, mobile units such as cold-rooms and freezers, mobile kitchens, mobile toilets and mobile offices. Zwane has created linkages abroad with African countries like Botswana, Swaziland and Malawi, where Siyazenzela Trailers has footprints with its products. Siyazenzela Trailers is currently increasing its production capacity through the state of the art factory that is in the process of being built which will enable the company to meet international demand. BusinessFit is a formally constituted black female owned enterprise comprising a team of experienced business owners. 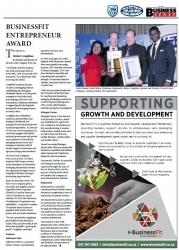 The BusinessFit award is given to an entrepreneur who contributes to the KwaZulu-Natal economy through providing sustainable and quality products or services to its customers as well as creating employment. This award is in line with BusinessFit's aims, which are to grow entrepreneurs and their businesses, and to encourage a culture of continuous improvement in delivery of core competencies, client relationships and therefore, the provision of job opportunities.